Willow knows she's different from other girls, and not just because she loves tinkering with cars. Willow has a gift. She can look into the future and know people's dreams and hopes, their sorrows and regrets, just by touching them. She has no idea where this power comes from. but the assassin, Alex, does. Gorgeous, mysterious Alex knows more about Willow than Willow herself. He knows that her powers link to dark and dangerous forces, and that he's one of the few humans left who can fight them. When Alex finds himself falling in love with his sworn enemy, he discovers that nothing is as it seems, least of all good and evil. In the first book in an action-packed, romantic trilogy, L.A. Weatherly sends readers on a thrill-ride of a road trip - and depicts the human race at the brink of a future as catastrophic as it is deceptively beautiful. They're out for your soul... and they don't have heaven in mind. This was a thrilling, action-packed, drama-filled, (somewhat cheesy) romance novel. 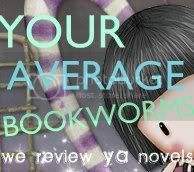 It was addicting and made me flip page after page because I had to know what was going to happen. It was definitely hard to put down. Alex and Willow's relationship definitely had it's similarities to that of Bonnie and Clyde. 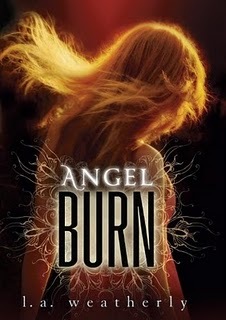 This was the first book ever to make me hate angels and see them as something that harmed humans instead of helped them. Willow had the ability to know someone's future, their past, and their thoughts just by holding their hand. I would've liked to read more of Willow's reading because they were really interesting. It definitely would've been useful to detect if someone was lying or not. And it was thanks to Willow's ability that her and Alex were safe till the end. Alex and Willow's love was something very powerful, and they were willing to do anything for each other, even if it meant running miles and miles to find them. Although... I couldn't help but cringe at some cheesy things they said to each other. I'm just not really the cheesy romance novel type. I liked the alternating POVs from Alex to Willow to Jonah to the angels. I got to know everyone's side of the story and what they were thinking and feeling. I thought finding about Alex's feeling for Willow, and Willow's feelings for Alex, and them slowly falling in love with each other would make me dislike this book because of past experiences. But I was pleasantly surprised. it got me frustrated... in a good way... if that makes sense... I couldn't help thinking, JUST KISS HER ALREADY. The ending was not the best, in some way, it was a cliffhanger ending. And now, I MUST read the second book to know what happens!!! I was VERY frustrated and upset that the CIA's plan failed, and nothing was resolved. The author definitely did well in bringing out the reader's emotions. First sentence: "Is that your car?" asked the girl at the 7-Eleven checkout counter. "The shiny black one?" Oh, this all sounds so awesome. I'm currently on page 90 and I simply cannot get into the story. No idea why:( I should stick to it and try to continue it soon!